Home > Health Issues > Kidney, Liver and Pancreas > Liver Support > Thorne Research Hepagen - Natural Liver Support for Dogs & Cats - 120 ct.
Hepagen is a natural liver support supplement for dogs and cats that combines the beneficial herbs milk thistle and curcumin (from turmeric) and other important ingredients that support liver function and help pets with liver disease. Hepagen - Liver Supplement with Curcumin and Milk Thistle for Dogs and Cats. Toxins, chemicals, preservatives, and artificial coloring can all place a strain on a pet's liver. Hepagen combines the beneficial liver herbs milk thistle and curcumin (from turmeric) with antioxidants and other important ingredients that support the liver's normal phase I and phase II detoxification processes. Hepagen also contains B vitamins that are beneficial to dogs with hepatitis, jaundice and other liver diseases. See the Ingredients tab to learn more about how Hepagen can help your pet with liver problems. I have two dogs who are both 12. My shepard/huskey was diagnosed with liver cancer. I started both of my dogs on this supplement and they both are doing great. I am pleased. I give these capsules to my 12 year old Pembroke Welsh Corgi every day as a natural supplement. She is doing very well on them and her labs have been very good. We believe in using the holistic approach whenever possible. I've been getting Liver Chews from my vet. I found your product on line for half the price. They seem to be working. Thank You. Unfortunately my dog was to ill and I had to have him put down. I do want to say that Holistic Pet did process and get my order to me extremely fast and I thought the price was reasonable. 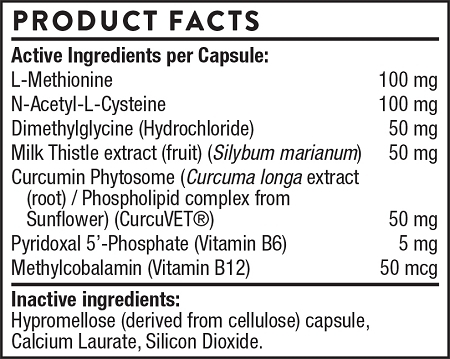 Milk Thistle extract (Silybum marianum) - 50 mg.
Silybum marianum comes from the herb milk thistle. The antioxidant activity of silymarin appears to stabilize hepatocyte membranes, neutralize free radicals, and maintain liver glutathione levels. 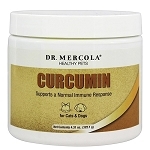 Curcumin Phytosome (Curcuma longa extract) (CurcuVET) - 50 mg.
Curcuma longa, also called Turmeric, has been used traditionally as a hepatoprotectant and cholegogue in both Chinese and Ayurvedic medicine. Its beneficial effects may be due to the fact that the constituent, curcumin, is a potent antioxidant and anti-inflammatory. Dimethylglycine (DMG) - 50 mg.
DMG is a derivative of glycine, the simplest amino acid. It is a building block for many importance substances, including methionine and choline. Vitamin B6 (Pyridoxal 5'phosphate) - 5 mg.
Pyridoxal 5'phosphate acts as a cofactor for enzymes, catalyzes reactions with amino acids, and aids in the synthesis of nonessential amino acids. Vitamin B12 (Cyanocobalamin) - 50 mcg. Vitamin B12 is required for proper digestion and absorption of food. This essential vitamin is needed for the formaton of new red blood cells and for healthy nerves. It may become deficient in chronic liver disease, causing a variety of problems, including anemia. Methionine helps metabolize fats, preventing their build-up in the liver. It is a powerful antioxidant and helps maintain glutathione. Glutathione is the liver's most important detoxifier. NAC is a powerful liver detoxifier. One of its most important functions is in its ability to recycle glutathione to its reduced state. Inactive Ingredients: Hypromellose (derived from cellulose) capsule, Calcium Laurate, Silicon Dioxide.. Dosage for Cats: 1/2 capsule daily. 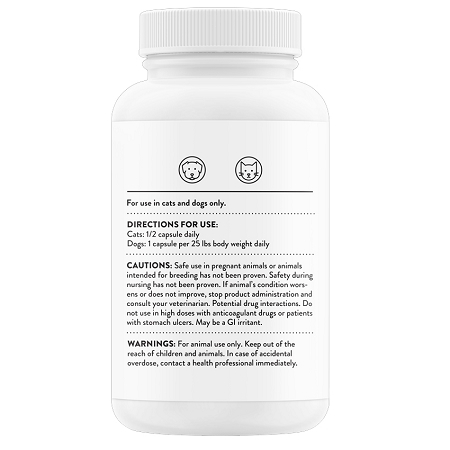 Dosage for Dogs: 1 capsules for every 25 lbs body weight.